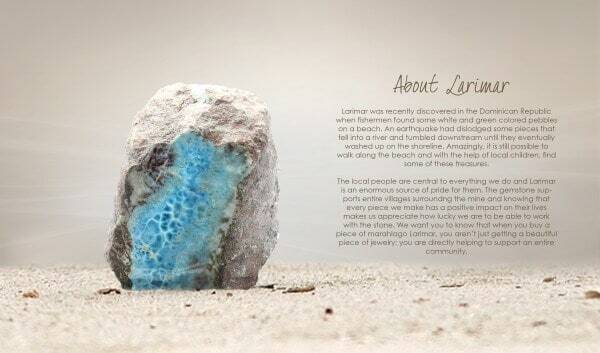 The Marahlago collection uses the finest quality of Larimar available; known as the gemstone of the Caribbean that reflects the natural beauty of the sea. Each Larimar stone is completely untreated and is mesmerizingly unique with shades of blue and white that is set in intricate Sterling Silver designs. Take pride in knowing that by purchasing a piece of Marahlago, you are not only adding a beautiful piece to your own collection but you are directly supporting entire villages in the mountains of the Dominican Republic. Stop by today to purchase a piece of this rare and precious jewelry that is said to bring peace, tranquility and neutralize negative influence to the proud wearer. All authentic Marahlago bears the trademark of a flower and has a 3 year warranty against manufacturing defects. When a Marahlago piece of jewelry is purchased, each item comes with a polishing cloth especially designed to keep your jewelry looking bright and new.